Westminster Archives‘ resources range from parish records to local maps, but why not come and take a look at one of the less frequently utilised resources – our collection of newspaper cuttings? Although we hold local newspapers in our collection, the newspaper cuttings collected and collated over the years are a quick and easy way to discover historic events, changes to streets and the ongoing history of buildings in an area. Perhaps there is a historic event that you remember which is detailed in our collection? 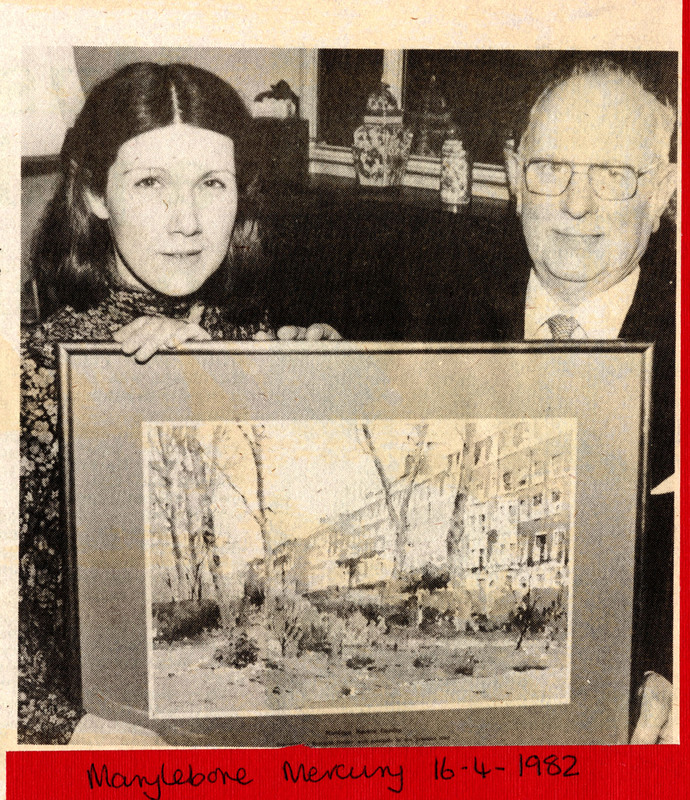 Open Garden Squares is coming up this weekend (13-14 June) so I took a look at some of the newspaper cuttings for those in our area: Bryanston Square, Montagu Square, Belgrave Square and Eaton Square. 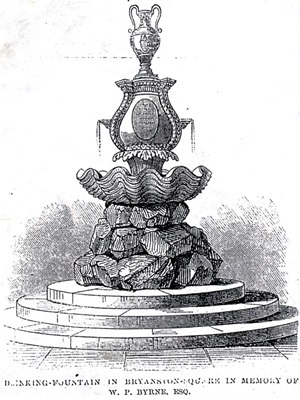 Below are some of the articles I found – just a few of the fascinating historic articles on the garden squares of the City of Westminster. 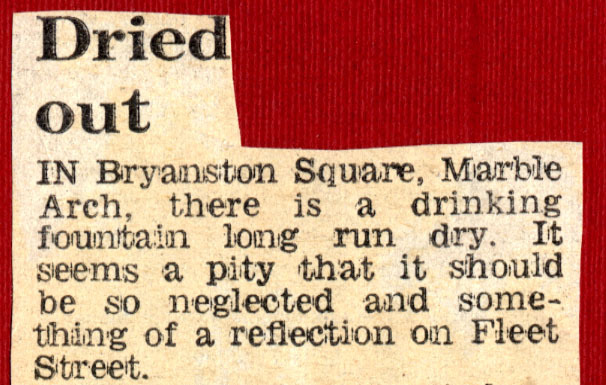 Quirky tales can often be found in our cuttings. 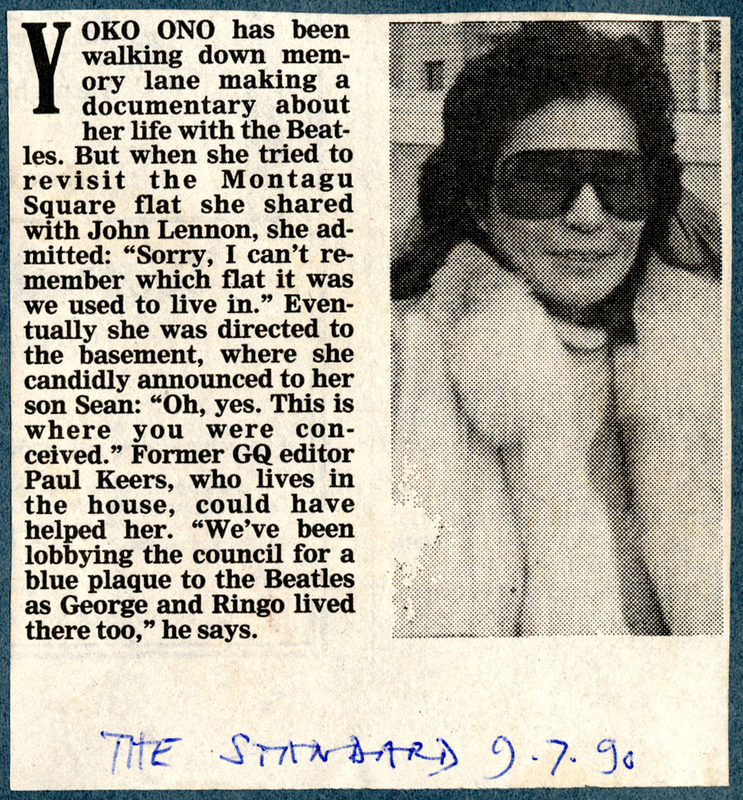 Here is Yoko Ono in 1990 reliving her time at Montagu Square, where she shared a flat with John Lennon. 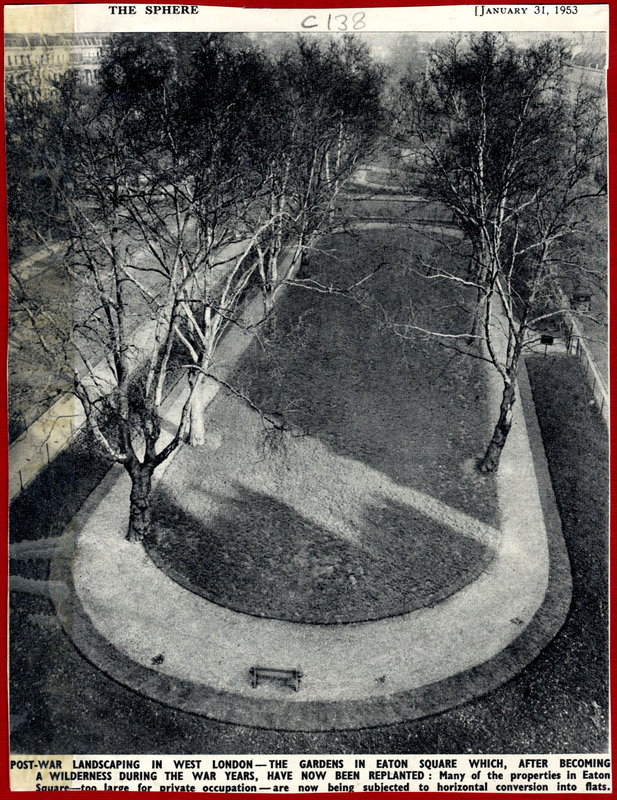 In 1982 the members of the Montagu Square Garden Trust observed resident Reginald Heaney’s 70th birthday with a watercolour of the square and garden. If you couldn’t be outside to enjoy the garden, looking at a lovely painting instead might do. 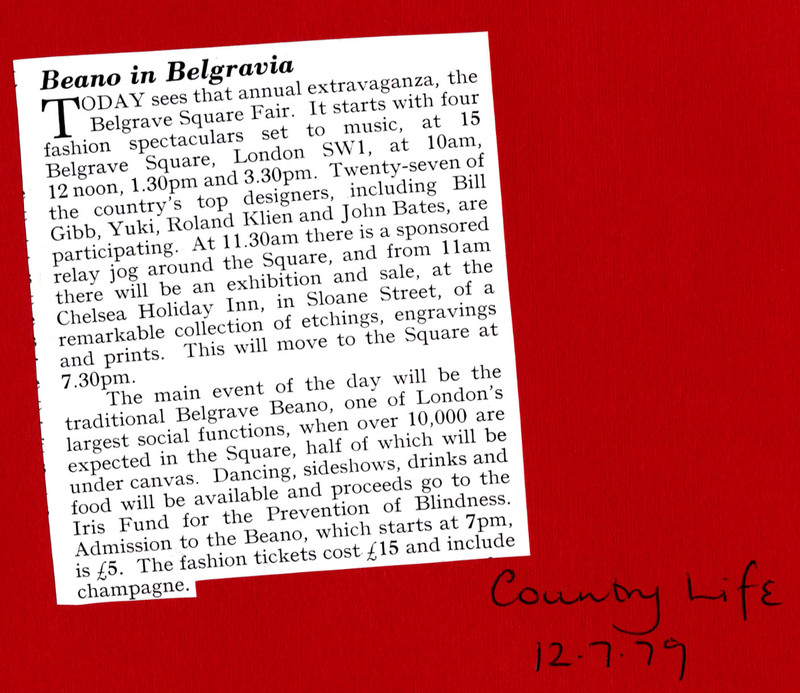 In 1979 the annual ‘extravaganza’ at Belgrave Square took place; a fair with top fashion designers, music and even a relay jog. The main event, the traditional Belgrave Beano, was an exuberant evening event where socialising amid dancing, food and drink was a highlight of the year. Look out for signed architecture on the houses alongside the 4.5 acre garden at Belgrave Square. 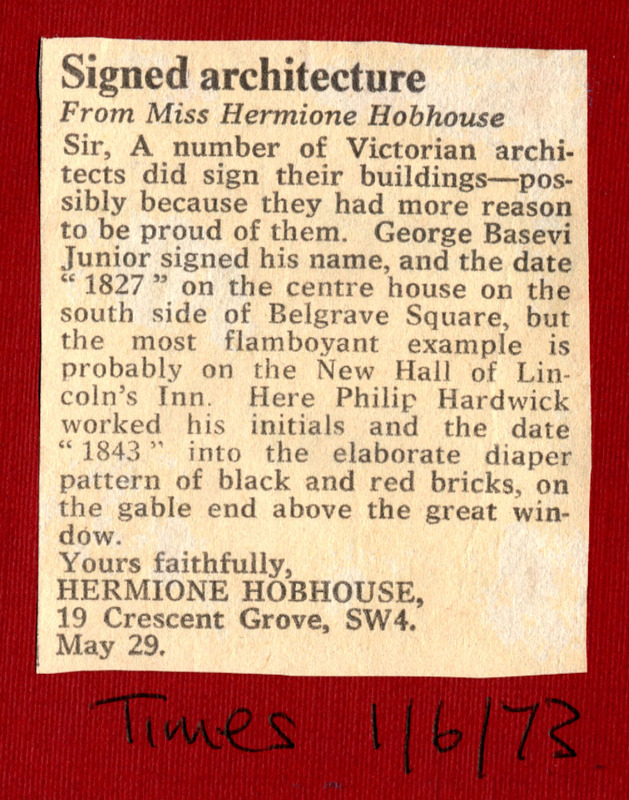 An article in the Times (1973) gave instructions on locating the Victorian architects who were proud enough of their work to inscribe their names in various places on the buildings. Can you spot George Basevi Junior’s name or Philip Hardwick’s? Neville Chamberlain, who was prime minister from 1869-1940, and actress Vivien Leigh were each given a blue plaque at Eaton Square. Vivien Leigh lived at number 54 Eaton Square from 1913 to 1967 whilst Chamberlain occupied number 37 from 1923-1935. Both these famous past residences of Eaton Square and their new plaques were awarded note in our newspaper cuttings. Our newspaper cuttings can be searched with a visit to our Archives Search Room. Visit our periodicals website, WULOP, to see a list of the local newspapers we hold in our collection. Interested in other outdoor areas of London? Quiet London by Siobhan Wall gives an excellent guide to the less frequently trodden areas of London, including some captivating hidden gardens, most of which are open throughout the year. This entry was posted in Archives Centre and tagged architecture, archives, Belgrave Beano, Belgrave Square, Blue Plaques, Bryanston Square, cuttings, drinking fountain, Eaton Square, Evening Standard, history, local, local history, London, Montagu Square, Neville Chamberlain, newspapers, Open garden Squares Weekend, Times, Vivien Leigh, WULOP, Yoko Ono. Bookmark the permalink.